Glow in The Dark Face & Body Paint - ONLY $10.28! Glow in The Dark Face & Body Paint – ONLY $10.28! Score a GREAT DEAL on the Glow in The Dark Face & Body Paint – UV Reactive Fluorescent Face & Body Paint – 12 x 10ml Professional Best Quality Paints – Glow in The Dark Blacklight Reactive Costume Makeup Party Supplies – Free Stencils today for only $10.28 from Amazon! You will get FREE Shipping if you are a Prime member! If you are not an Amazon Prime member you can grab a FREE 30-Day Trial HERE! Get the all the Details of this deal below! ✔ GLOW IN THE DARK PAINTS: Beautiful UV reactive liquid face and body paint. You’ll marvel at the bright neon colors when they come into contact with UltraViolet or Blacklight. 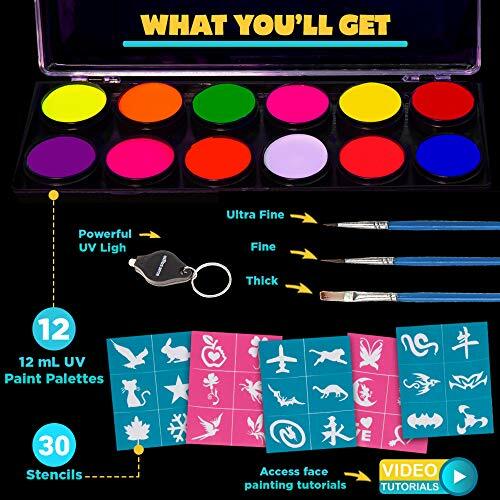 ★ IMPORTANT: PAINTS WILL ONLY REACT WHEN UV LIGHT IS PRESENT ★ This Professional Face and Body Paint Palette contains enough paint to be used for 100+ faces supplied in a STURDY reusable cosmetic carry case with also 30 reusable Stencils & 3 Brushes. ✔ 12 NEON COLORS. Your Blue Squid UV Water Activated Paints come in twelve vibrant 10ml colors which glow with amazing fluorescent brightness under an UV light. Colors include sunflower yellow, buttercup lemon, lightning lime, sunset orange, tangerine orange, blood orange, neon pink, popping purple, glowing green, electric blue, shimmering silver & cherry red! NOTE: COLORS ONLY REACT WHEN UV OR BLACKLIGHT LIGHT PRESENT. ✔ PERFECT FOR SENSITIVE SKIN:Your Blue Squidfacepaints are safeprofessional superior cosmetic grade makeup;hypoallergenic, paraben-free, non toxic, vegan, natural and FDA-compliantwhich makes it ideal for those with sensitive skin. As with all cosmetics we advise that a small skin patch test is done before applying as everyone’s skin is different. They are water activated so clean up is as quick and easy as wiping the face paint off with a soapy washcloth or baby wipe! ✔ PERFECT FOR MANY USES: Including Stars, Party Supplies, Nails, Balloons, Slime, Spray, Festivals, Clubs or Raves school, church, festivals, carnivals, birthday parties, cosplay costume, fx, camo, belly pregnancy, prime sports, theatre performances, role play, Halloween; anywhere that has UV lights. Fine for most fabrics but some staining may occur, try before use. ✔ 100% RISK FREE PURCHASE! We’re so confident about the quality of our face paints that if you have any issues, we’re very happy to either provide a no-questions-asked refund or replacement. Order today risk free while stocks last!PLUS FREE access to our online kids facepainting video tutorials with step-by-step videos that show you how to whip up fantastic face paint designs. When your Blue Squid Face Paint for Kids arrives in the mail you’ll want to immediately take it out of its high-quality packaging. Your kids will “ooh” and “ahh” over the beautiful colors. And you’ll love that the face paint is washable, non-toxic and completely kid-friendly. Use one of the three included face painting brushes to paint your child’s cheek or forehead. Smile at how smoothly the facepaint glides on and how quickly it dries. It’s soo easy-to-use and there’s no mess to clean up afterwards! Stumped for what to to do with your face painting kit next? We’ll include a FREE bonus online videos with the face paint kit that will turn any parent into an almost professional face painter. The free access online site also includes many face painting ideas and face painting designs. And when it’s time to clean up? Your Blue Squid face paint washes off with nothing more than a soapy washcloth. Please Note: As with all cosmetics always do a skin patch test before use. Order your own Blue Squid face paint set today RISK FREE! But you do need to hurry. Inventory is limited. And due to the demand for this product we often have a hard time keeping it in stock. Click the yellow “Add To Cart” button and we’ll rush your Blue Squid face paint palette straight to your front door! Copyright Blue Squid 2018. Sold Exclusively By Blue Squid. Don’t miss this deal at Amazon Today on the Glow in The Dark Paint – UV Reactive Fluorescent Face & Body Paint – 12 x 10ml Professional Best Quality Paints – Glow in The Dark Blacklight Reactive Costume Makeup Party Supplies – Free Stencils for only $10.28!